Convenient Boston parking garages near Theatre District shows and Chinatown can be tricky to find. Streets in this older part of downtown Boston are narrow and may be one-way only. Cars must compete for space with pedestrians, making driving difficult and parking almost impossible. And forget on-the-street parking. Very few spaces are available, and they fill up fast. Park on the narrowest streets, and you risk of getting your car's sides scraped by other vehicles trying to squeeze by. But garages can be tricky too. Rates vary by quite a lot . . . especially if you don't know about available discounts, validations, and special rates after business hours. 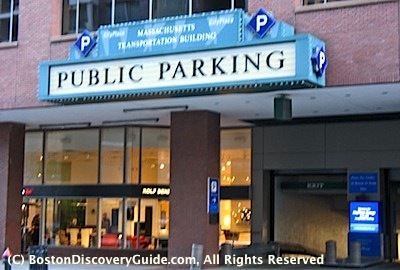 Here are our recommendations for the most convenient and affordable Boston parking garages near the Theatre District as well as the clubs and restaurants located in this area. These garages also work well for Boston Common, Chinatown, and the Public Garden. 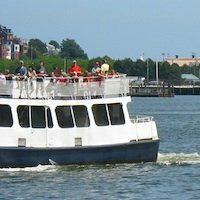 Some are also reasonably close to Bay Village, Park Square restaurants, Tufts Medical Center, Emerson College, and Theatre District hotels. Caveat: Although I provide rates for Boston parking garages near the Theatre District for you to use for comparisons, they change frequently - so do verify them on garage websites or call if you're trying to get the best deal. This map shows Boston parking garages near the Theatre District, Chinatown, and other attractions in the area. The underground Boston Common Garage hits the sweet spot of convenience combined with reasonable evening and weekend rates. Other Boston parking garages near the Theatre District and Chinatown may be cheaper but tough to get to or navigate; still others are more convenient but pricier. The Boston Common Garage is my own hands-down favorite for Theatre District parking. Why? The easy Charles Street entrance into the garage is a plus, especially if you're trying to navigate through rush-hour traffic, but the real benefit happens when the shows end. Everyone who parked closer gets locked in gridlock as they jam the 1-lane, 1-way streets around the theaters. Park under the Common, and you'll happily stroll by the stalled traffic, find your car, and sail out the Charles Street exit, unimpeded. The only drawback? Despite its 1,300 spaces, it can be too popular. Sometimes, the entrance will be blocked by the dreaded "Garage Full" sign. If you plan to park here, you always need an alternative. 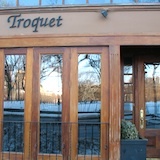 Location: 5-10 minute walk from most theaters and comedy clubs throughout the Theatre District, 5 minute walk from Loew's Boston Common 19 and Stuart Street Playhouse movie theaters, and 5-10 minutes from Theatre District (including Chinatown and Park Square) restaurants. 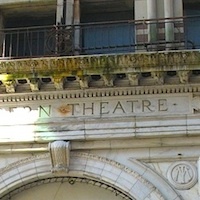 Location: Theatre District - almost directly across from the Boston Opera House, and very close to the Paramount, Orpheum, and Modern Theatres; Hyatt Regency Hotel, various Theatre District restaurants, and Chinatown. 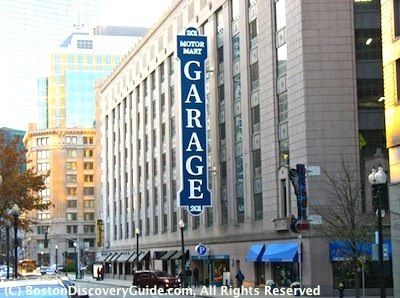 Lafayette Garage Discounts: Boston Opera House Special of $2 off the evening/weekend rate if you prepay via the website; Shoppers' Special of $2 off of the first and second hour parking rates with validation stamp from participating local merchants, including Macy's. Lafayette Garage's location right in the heart of the Theatre District stretch along Washington Street means it's in big demand from people coming to a show. Rates are pretty good for this part of town, especially if you can get the Shoppers or Opera House discount. 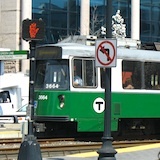 CityPlace Garage is located beneath the mammoth State Transportation Building at the corner of Stuart and Boylston Streets. 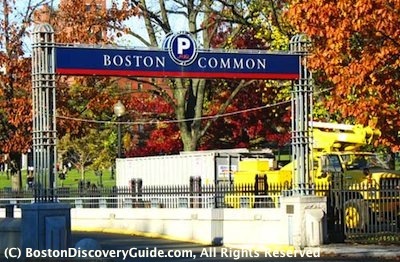 It's one of the most convenient Boston parking garages near the Theatre District and almost as easy to get in and out of as the Boston Common Garage. It's also right across the street from the W Hotel Boston and Market restaurant, so if you're heading there for dinner and don't want to walk the extra 3-4 minutes from the Boston Common Garage, you can save about $10 plus tip by self-parking here and crossing the street rather than opting for valet parking by the W.
If you park here during the day, you'll get very good rates, even if you stay over 3 hours and have to pay the daily rate. But you'll pay $20 at night and for 2 or more hours on weekends, one of the higher evening/weekend rates in the area. 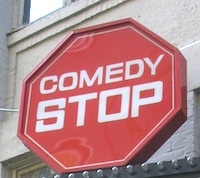 With the less expensive Boston Common Garage only 3-4 minutes farther away, where to park when coming to this part of the Theatre District may seem like a no-brainer. But if the weather is really bad - you know, snow, ice, freezing rain, a nor'easter, a drenching thunderstorm - the extra that you'll spend to park here will be cheaper than ruined shoes. This garage also works well if you're heading to the dance clubs located nearby. Just remember that it closes at 2:30am. City Place Garage is also a good back-up if Boston Common Garage is full. Although Motor Mart Garage has been renovated over the years, it dates back to the Prohibition era, when reportedly it provided more than just parking. 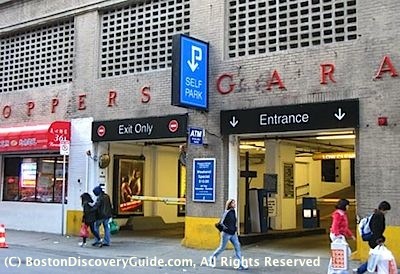 It is the most historic Boston parking garage near the Theatre District - and possibly in the entire city. Motor Mart can be a good choice in the evening or weekends if you're sure that you'll need parking for less than 3 hours. 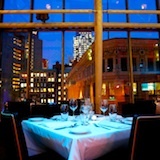 If you're dining at one of the restaurants that will validate your ticket, you'll get an even better parking discount. But stay longer than 3 hours, and rates get punitive compared with other Boston parking garages near the Theatre District. Parking spaces and turns are also a bit tight if you're driving a large vehicle - although other city garages share this trait. If the 3 hour time limit for cheap parking rates work for you - or if you don't mind paying a higher rate for parking longer - Motor Mart is very convenient for certain locations, such as Bay Village and the Park Square restaurants. Shoppers Garage normally has some of the lowest rates around. The drawback? Shoppers Garage is located in the heart of Chinatown, and takes a few more minutes of navigating around traffic and pedestrians to get to. Although Beach Street is one of the major streets in Chinatown, it's still kind of narrow and almost always congested, surrounded by 1-way streets that funnel you directly into even more congested Theatre District traffic. But with the low parking rates, you're nicely compensated for your efforts (and time). 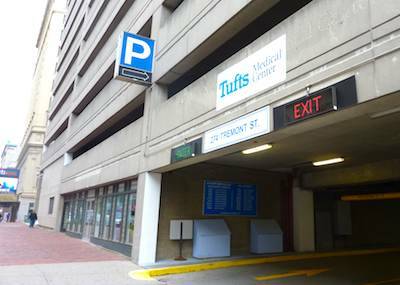 You're sure to notice the huge Tufts Medical Center garage next to Citi Arts Performing / Want Theatre - but you should know that affordable rates are usually available here only for Tufts Medical Center and Floating Hospital for Children patients. For affordable parking rates on this block if you're attending a show at the Wang, Shubert, or Wilbur Theaters - or heading for one of the clubs in this area, or an event at the W Hotel across from the Wilbur - look for the open-air parking lot next to this garage, where evening event rates usually run in a very reasonable $14 range. On the other hand, if snow is falling, you'll appreciate the convenience of a garage and the $28 for up to 7 hours range will feel like a bargain compared with scraping snow and ice off your windshield - especially compared for the $40+ valet parking typically charged in this area. I've used this garage for (reimbursed) business parking, and appreciate the easy-to-navigate layout and reasonably wide spaces, especially compared with some of Boston's older garages. Rates: Evening events parking here is usually offered for about $14; daytime rates are higher, but less than the Tufts Medical Center Garage next door. These Boston parking garages in the Theatre District do not necessarily have the best rates but there will be times when their locations may be perfect for you. 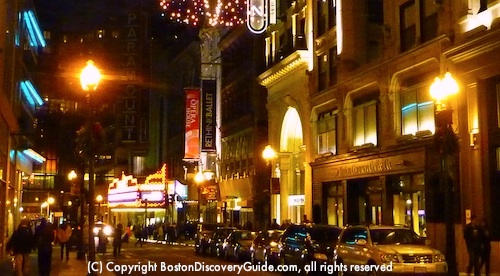 Looking for things to do in Boston's Theatre District after you've parked?